We started our day off with breakfast – dad had an ‘Ultimate breakfast’ (previously known as Brogan’s breakfast) and I had a bagle with cream cheese. Both were really good. After breakfast we headed to HMV where I bought a David Bowie album (a “just because” present for dad) and he bought a dvd boxset of I I Dream of Jeannie. A TV show he loved when he was younger. After HMV we headed to Primark. We have three Primark stores local to us but they are quite small, so they can be very hit and miss. The biggest Primark near us is about an hours drive away. 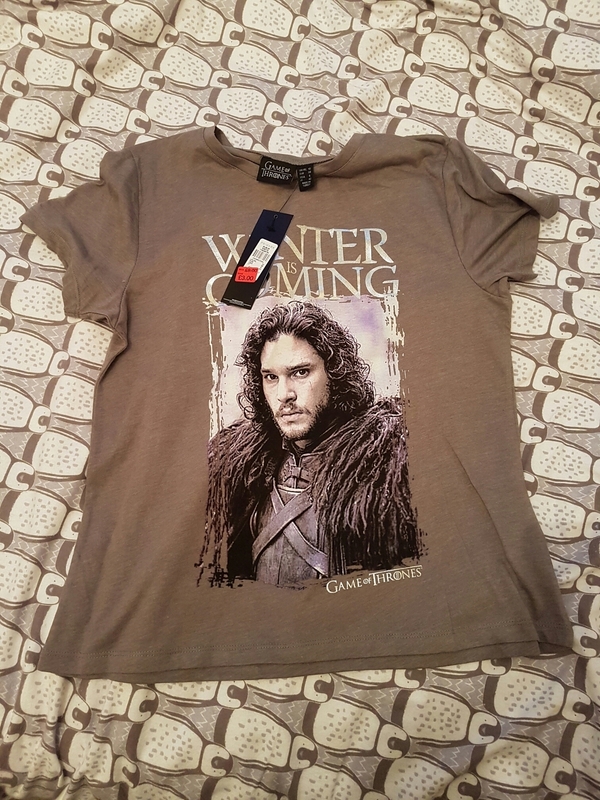 I picked up a Game of Thrones tshirt on sale for £3(!) and dad bought my sister a Jigglypuff (Pokemon) onesie. Before we headed back to the car we popped into Crystal and then into Lush. I’ve been on the hunt for a Rose Quartz bracelet for months now but haven’t found ‘the one’ yet, I keep checking back in Crystal when their new season range comes out. What I’m looking for is Rose Quartz set in a silver brant but they seem to have every other stone except that one. Lush – I spent ages in Lush! Their new Spring and Easter ranges are in so I spent time looking at the new products and we had a chat with one the sales assistants about their charity bath bomb. She was very friendly and knowledgeable. I came away with three bath bombs. My dad’s a Sci-fi fan and convinced me to buy this one, it’s pretty cute. This is the charity bath bomb I mentioned before, the proceeds (minus the VAT) go towards Reprieve who work to help people who have been or are currently victims of human rights abuse. We finished off our morning in Swindon being stuck in traffic(!) for half an hour. We’re not really sure why the traffic got so busy, it wasn’t rush hour. We left a little after midday. Anyway, we had a very good day and had a well deserved coffee once we got back to my home town. 🙂 It was great to catch up with him. Sounds like a really fun shopping trip. I love the Game of Thrones shirt you bought. I can’t believe it was only £3! I really need to get myself back to Primark. I rarely go now (probs because I used to work there so I’m forever traumatised), but they seem to have some really cool things. They never had all the licensed stuff before. I really want a Jigglypuff onesie! That’s so cool. I used to love I Dream of Jeannie as a child. My mum always used to put it on, and even though it was really old-fashioned I thought it was great. It was always that and Bewitched! The bath bombs you bought look great! Lush do some really lovely things, it makes me want a house with an actual bath. I don’t think flinging bath bombs up and down in the shower will have the same effect! Glad you had a good trip!